Pager charger 5 - check them out. Pager charger 5 for the LRS SP5 rechargeable text pagers and our T901 handheld transceiver. The pager charger 5 is used for SP5 pagers which are one line alphanumeric rechargeable pagers. 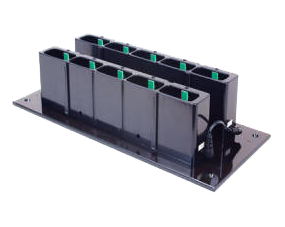 As you can see these units come in 5 pager components that can be 'joined' together with a small jumper lead - easily able to handle thirty pagers form one power supply. Remember that all of our products have at least a three year warranty against manufacturers defects and we really do honour all genuine warranty claims. 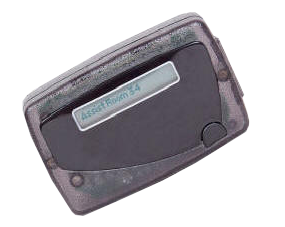 The pager charger 5 can be configured to hold from 10 to 25 pagers or handhelds. Charging is through nickel-plated charging plates located inside each slot of the charger 5. Each charger has two jacks for cascading multiple chargers together using the 1" jumper wire included. Because our charger 5 stations are cascading, they only require one power supply which reduces the space required. With our optional base plate this charger 5 can be mounted on the wall to reduce space even further.